Preconstructed Magic occupies a curous place in the pantheon of Magic formats. On the face of it, it bears the hallmarks of COnstructed. 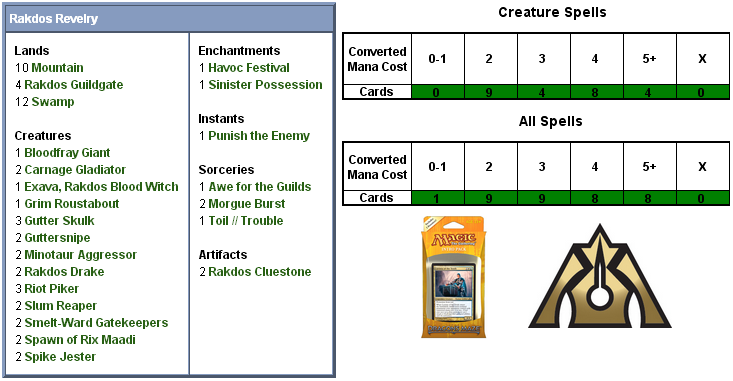 After all, one might wryly observe, you can’t have “preconstructed” without “constructed.” They might not be the world-beating decks that come to mind when you talk about the “standard environment,” which has a pulse and pace all its own, but nevertheless they are sixty-card constructions crafted from a particular card pool. Still, it’s hard to escape the feeling that there’s an element of Limited in here, too. Although you’d never confuse a precon deck for one assembled during a draft or sealed event, card and environment evaluation often have more in common with limited rather than standard constructed. With our card rarity access highly regimented- two rares, no mythics, etc- you’re forced to embrace the cards that appear at the lower rarities to fill in the bulk of the deck. There’s a reason that the new set review of the Limited Resources podcast spends the lion’s share of its time on commons and uncommons, and the valuable observations and insights offered there are just as applicable to the cards that make up our preconstructed decks. That makes preconstructed Magic something of a hybrid, blending the deck structure of Constructed with the card pool of Limited. One of the interesting things about the Intro Packs is seeing how they represent their respective environments, alongide each set’s themes and mechanics. For Return to Ravncia block on the whole, this has meant a bit of a slowdown of the overall environment. Zac Hill, a developer who recently left Wizards of the Coast to pursue a more humanitarian-minded career path, recently returned to the mothership to discuss the Limited environment of Dragon’s Maze. Unsurprisingly, the word “slow” kept coming up in his discussion. The idea, then, was to embrace a Rosewaterian maxim—”If it’s not at common, it’s not what your set is about”—and create some common cycles that tied the set together. These became the Gatekeepers and the Maze creatures, which also served the “half” a goal very nicely: slowing the set down. Whenever you “hiccup” on mana, it’s just less likely that you’re deploying threats quickly, so we figured the Draft environment post- Dragon’s Maze would be relatively slow. …we wanted to start the format out pretty fast—creating a “change in feel” from Return to Ravnica to Gatecrash because of the five new guilds, and a change from Gatecrash to Dragon’s Maze because the format would slow down dramatically. On top of that, we’d be remiss if we neglected to mention that the Return to Ravnica and Gatecrash decks also included a pair of Keyrunes to supplement the manabase, while Dragons’ Maze replaced them with Cluestones. Taken together, this appears to be a deliberate move to offer a little more consistency to the newer player in a slower environment, letting them more reliably field their more expensive cards. It remains, however, a bit of a worrying trend, as it also increases the occurrence of mana flood. It remains to be seen whether this is a permanent change of direction for the product line, or a simple deviation for a particular environment. It’s certainly not without some ripple effects, as we’ll see in particularly sharp contrast with today’s guild. Unlike the first incarnation of the new Rakdos, in Rakdos Raid for Return to Ravnica, Rakdos 2.0 is completely devoid of one-drops. This is unfortunate, because playing fast, aggressive cards that become even stronger if they forego the ability to block is what the Rakdos is all about. The over-saturation of land alongside the Cluestones can work for more mana-intensive decks, but the attempt to make a universally midrange setting upon which to stage all of the different decks probably lets the Rakdos down most of all. This isn’t Caramon Majere in the War of the Lance, this is Caramon Majere as we see him early on in Time of the Twins. Drunk and gone to fat, telling and retelling stories of glory days gone by. This is a pity, because there are some very solid aggressively-minded additions to the Rakdos arsenal this time around. The Spike Jester is a 3/1 with haste, and while fragile on the backend, a 3-power surprise attacker can make good things happen. Since it doesn’t boast the guild’s trademark mechanic, it can also be used defensively if things start to go pear-shaped. High-power creatures tend to make decent blockers if only for the caliber of attacker they can take down with them. The deck gives you two of these, as well as a full trio of Riot Pikers. The Goblin Piker’s drunk-on-mayhem cousin, the Riot Piker trades a vulnerability (must attack each turn) for first strike. Since that means that whatever can profitably block it and live to tell the tale must be a 1/3 or better, the Riot Piker has a window of opportunity early in the game where your opponent might simply let him in for damage. There’s also a trio of Gutter Skulks here, which is the Ravnican version of the Walking Corpse. Only recently has Black been given the ability to have an on-curve 2/2, as for many years its go-to standard was the three-mana Scathe Zombies (or equivalent). Although that’s useful for Black, it’s not great here. These really want to be Gore-House Chainwalkers instead, but the deck will have to make do. We also find our first occurrence of unleash here in the Grim Roustabout, one of the less-impressive members of his breed. A 2/2 with regeneration is nice, but in a perfect world the Rakdos is blowing through their early mana flooding the board with threats. The fact that we get to our three-drops with only one unleash card seems at odds with what the guild and mechanic are designed to be: hard-charging and aggressively hellbent-for-leather. We’d like to say that things begin to improve from here, but alas we come across a pair of Guttersnipes as we move to the three-drops. The Guttersnipes are much more suited to the Izzet thanks to their reliance on spells, but the nice thing about the Guttersnipe is that he doesn’t discriminate- he’ll throw out his extra damage regardless of which guild is playing them. Of course, that means you’ll want to have a lot of sorceries and instants to take advantage, but Rakdos Revelry only has five- six if you count each half of the deck’s split card. Even then, if you combine both halves of the card through fuse it only counts as a single spell, so even then you won’t get to live a dream of fusing Toil // Trouble and unloading on your opponent for 8 or more points of damage/life loss. The deck doesn’t really want the Guttersnipe as a singleton, let alone two of them. Then there’s the Rakdos Drake, the second card here with unleash. This isn’t a bad addition to the guild, but one has to wonder if it’s worth paying the premium for an evasive creature rather than just a large one. The Rakdos should come screaming out of the bloodhalls in numbers, relying upon their larger size (gained from unleash) to allow them to overwhelm their opponent. The three mana that gets you a flying 2/3 here might be better spent on the 3/4 Dead Reveler or, going up a rarity level, a Hellhole Flailer. The Drake’s aren’t bad, but they do little to dispel the notion that Rakdos Revelry isn’t as Rakdos as it needs to be. Moving up to the four-drops, we find another glut of creatures eager to do our bidding, some better than others. The least of these is the Slum Reaper. Its untargeted Edict effect is symmetrical, so both sides lose their worst creature. If the idea behind the deck is that our creatures are better than their creatures at every point in the early game, this doesn’t seem like a very equitable deal. It might be palatable if the creature left behind was something unusually nasty, but a 4/2 is a bit too fragile to get excited about on turn 4. Then we have the Smelt-Ward Gatekeepers, which are Red’s entry in the Gatekeeper cycle of creatures that have added effects if you control two or more Gates. Getting a free Act of Treason isn’t bad at all, but there’s a hidden cost here that’s a bit at odds with the aggressiveness that the guild embraces as its ethos. First, to make the most use of the Gatekeepers you have to play with four Rakdos Guildgates, which the deck kindly provides. The problem, though, is that the Gates are inherently slow. The Rakdos at their best really don’t want to be using any guildgates, leaving them behind for the slower guilds whose gameplay ethos permits them the luxury of greater time. There’s a reason that the Rakdos Guildgate will set you back some loose change while even a played Badlands is a respectable wad of bills, and it’s not entirely explainable by scarcity. There’s an invisible drag placed on a deck by permanents that come into play tapped. Secondly, the body that the Gatekeepers leaves behind is a 2/4, when you’d much rather see it be a 4/2. Naturally. The good news is that if you’ve stuck with it this long, there are some delightful options awaiting you that put on a much better show for the adoring audience. The Bloodfray Giant, star of the Juri Revue, is a 4/3 trampler that can get even larger thanks to unleash. 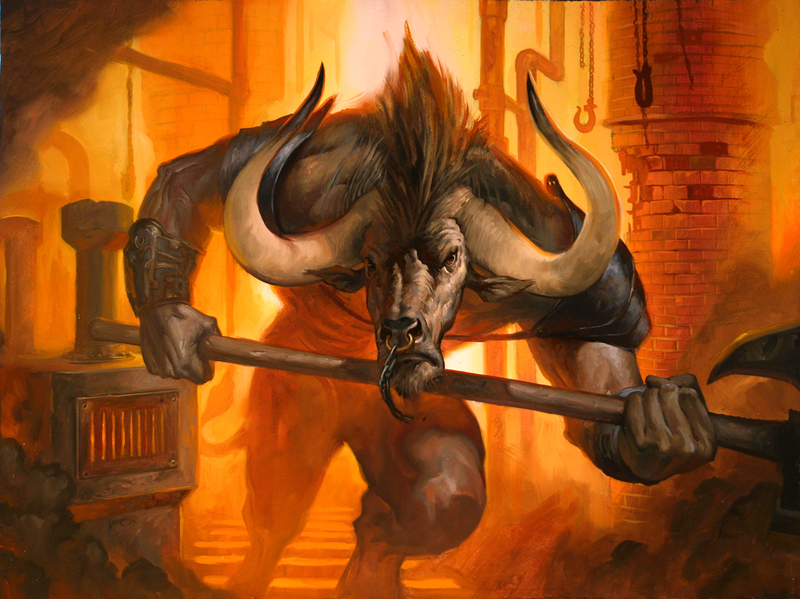 Though this starts to play in the space where the mana cost is a bit high for the guild’s unbridled aggresssion, a 5/4 trampler for four mana is a splendid deal. Sadly you only get one, but there’s also a pair of Carnage Gladiators on offer. The same caveat holds true here regarding the ticket price, but for the investment they’re great for the deck. A 4/2 with regeneration is okay here- it’s not as difficult as the Grim Roustabout because its not competing for that crucial early mana like the Roustabout is. Indeed, in an aggro deck you’ll start to have mana free at right about this point, and giving you places to sink it for added potency is always good. What makes the Gladiator shine, though, is its static ability that hoses blocking. This is a great move to bring even a stalemated game to an end, as you can throw your smaller, outclassed creatures into the fray for a final push for glory. Blocked or not, killed or not, they’ll all still get to contribute to the war effort. It might be a touch too fancy in a streamlined Rakdos deck, but in this midrange version it fits in just fine. Finally, the gem of the crown appears with Exava, Rakdos Blood Witch. The last time we saw a Blood Witch underpinning a Rakdos precon, it was Lyzolda in Rakdos Bloodsport. In that construction she served as more of a combo engine, her 1 toughness keeping her largely out of the red zone. Her successor, Exava, has no such scruples, and indeed much prefers to lead from the front. A 3/3 with first strike, haste, and unleash, she gives every other creature with a +1/+1 counter on it haste. This is a superb card, criminally underutilised here due to the paucity of unleash creatures. In a more dedicated build she’d be brutal, but even here a suprise, attacking 4/4 first striker out of nowhere for only four mana is simply outstanding. From there we have a few more closing options. A pair of Spawn of Rix Maadi have no special tricks outwith their unleash, but a cheaper Craw Wurm isn’t out of place in this slower Rakdos build. The Minotaur Aggressor makes a return from the original deck, and nothing about our valuation of the card has changed: nice body, pity about the cost. Though the more mana-intensive Dragon’s Maze decks provide a better environment for the Aggressor, seven mana for something that can be killed by a simple Mugging or Izzet Charm is too much to ask. The noncreature support on offer here is equally underwhelming. You’d expect a Red/Black deck to have substantially greater killpower than what’s included in Rakdos Revelry. Your only burn cards are a singleton Punish the Enemy and a pair of Morgue Bursts. Punish the Enemy is reminiscent of Searing Blaze, a spell that nicely blasts both a creature and its owner. In this case, the two are decoupled, though that’s only relevant in multiplayer. Five mana is a bit steep, but beggar’s can’t be choosers here. The Morgue Bursts are cut from similar cloth, two effects stapled together for a high sticker price. In this case, you get a creature card back to hand in the bargain. The problem with this card is that there’s not a lot of security in the card’s damage output. You’ll usually see mainly the cheaper, smaller creatures in the graveyard for most of the game, unless you’re fortunate enough to be playing an opponent trying to mill you out. The dream here, of course, is the Minotaur Aggressor, but more often you’ll be looking at your graveyard thinking, is that all? There’s a negative synergy here as well with unleash creatures, which are smaller in their natural state than they are on the battlefield. From there we have a number of singleton effects. Sinister Possession is a “bleeder” type card that seems more at home in Orzhov than Rakdos, and does little to change the battlefield calculus in the way that simple removal would. Awe for the Guilds is a mass Falter effect that’s conditional in what it effects. That makes it difficult to assess, as at times it will do very little, while other times it can secure you a lethal alpha strike. The deck’s second rare, Havoc Festival, appears here as well. This is an interesting card, in that it puts the game on a very swift timer. Though the lifegain shutdown clause won’t often be relevant, it will certainly give Orzhov players a moment’s pause. Although it would be well out of place in a more aggressive Rakdos build, Rakdos Revelry is a reasonable home. Its utility is diminished somewhat by the lack of consistent direct damage here, a means to finish off an opponent who’s been steadily circling the drain for a turn or two. What it lacks in strategy, though, it does make up for in feel and flavour- this is a carnival on a card! Toil // Trouble is the deck’s split card, and combines two useful effects. First is Toil, which is effectively a Sign in Blood. The extra cards are a great option for you at most any point in the game, while the ability to damage your opponent is never unwelcome. Like many fuse cards, this is esentially a two-card combo: let your opponent draw two cards and lose 2 life, then blast them for even more. It’s clever design and a fun card, and works well here. As for the deck’s manabase, it has the usual oversaturation in the format thanks to a glut of land and pair of Rakdos Cluestones. Overall, Rakdos Revelry seems a bit disappointing. To twist an old phrase, this isn’t the Rakdos deck that Dragon’s Maze wants, but it’s the Rakdos deck that Dragon’s Maze deserves. With its emphasis on slowing down the environment, a trend we’ve seen in evidence since Avacyn Restored, this is very much “midrange Rakdos.” That squanders the advantage that unleash offers, but the deck may have some charms all its own. We’ll find out when we take it into battle, and report back in two days. Although Dragon Maze replaced keyrunes for cluestones, the fact that keyrunes could attack made the decks more aggressive. Cluestones can filter for more cards if you don’t need the mana, but that’s time and mana not spent on hurting the opponent. So yeah, the change has made the lack of speed all the more apparent. I really appreciated the Dragonlance reference, the fat Caramon Majere reference made me laugh…and then cry for my poor Rakdos guild. Great review and article! Wonder how it plays out in the “slower” environment. I love Exava’s design. It’s a shame the rest of the deck can’t support her. The 26 land, in particular, feels uncomfortably like they’re cheating purchasers out of “real” cards…though I suppose the Guildgates and Cluestones make up that deficit? Also, the sweet spot for glacially paced decks is clearly 43 Lands. I agree with Jenesis in the sense that decks with so many lands feels like a rip-off because players get too few actual cards. I would have loved to see a more agressive rakdos, similar to the boros we saw in gatecrash. Exava is an excellent rare, and I am dissapointed in unleash’s few presence. I really like most of the guild keywords from both ravnica blocks, but I also like it very much when they are present in their respective decks in large amounts. It would seem much cheaper to acquire cards by buying online, including lands than overpaying for a deck with large amount of lands. The 2 packs included don’t justify the high price-tag attached, I think the MSRP could even go as low as 12 with deck quality this low nowadays. Still, I am interested in the matchups since Rakdos did pretty well last time they went on the battlefield. This rakdos precon is less attractive than its predecessor, since it lacks its fantastic one and two drops, but at least it packs exciting cards like Exava and the Spike Jesters.